Gerontissa (Abbess) Gabrielia was born in Constantinople a hundred years ago on October 2/15, 1897. She grew up in the city until her family moved to Thessaloniki in 1923. She went to England in 1938 and stayed there throughout the Second World War. She trained as a chiropodist and physiotherapist. In 1945 she returned to Greece where she worked with the Friends Refugee Mission and the American Farm School in Thessalonika in early post-war years. Later she opened her own therapy office in Athens until 1954. In March of that year her mother died and the office was closed. Sister Lila left Greece and traveled overland to India where she worked with the poorest of the poor, even the lepers, for five years. It was not until 1959 that she went to the Monastery of Mary and Martha in Bethany, Palestine, to become a nun. When she arrived she asked Fr. Theodosius the chaplain for a rule of prayer. Fr. Theodosius was somewhat surprised to find that she could read even ancient Byzantine Greek. Fr. Theodosius said, “The great elders that we hear about no longer exist. I certainly am not one. You came here to save your soul. If I start giving you rules, you will lose you soul and I will as well. But here is Fr. John. He will be your elder.” So for her first year in the monastery he set her to reading only the Gospels and St. John Climacus (it should be noted that at that time the Ladder had not been published in modern Greek). She was three years in Bethany. In April, 1962, word came that Patriarch Athenagoras of Constantinople sought to send an Orthodox monastic to Taize in France. Sister Gabrielia went by way of Taize (she spoke fluent French from childhood) to America. In 1963 she was back in Greece. The Gerontissa was tonsured to the Small Schema by Abbot Amphilochios (Makris) on Patmos in the Cave of St. Anthony under the Monastery of Evangelismos just before she and the nun Tomasina left again for India. Elder Amphilochios was enthusiastic at the idea a nun who would be open to the an active outreach in the world. In India she was for three year in Nani Tal in Uttar Pradesh where Fr. Lazarus Moore was the priest and where he consulted the Gerontissa in his translations of the Psalter and the Fathers. Between 1967 and 1977 the Gerontissa traveled in the Mission field of East Africa, in Europe including visiting old friends and spiritual fathers Lev Gillet and Sophrony of Essex, again to America, and briefly in Sinai where Archbishop Damianos was attempting to reintroduce monasticism for women. She traveled extensively, with much concern and broad love for the people of God. Some of her spiritual children found her in Jerusalem beside the Tomb of Christ; others found her on the mission field of East Africa. For years beginning in about 1977, she lived hidden in a little apartment, the “House of the Angels” in Patissia in the midst of the noise and smog and confusion of central Athens. A little place, a hidden place, a precious place to those who knew her there. In 1989 she moved to Holy Protection hermitage on the island of Aegina, close by the shrine of St. Nectarios. There she called the last two of her spiritual children to become monastics near her, and there she continued to receive many visitors. At the start of Great Lent in 1990 she was hospitalized for lymphatic cancer. She was forty days in the hospital, leaving during Holy Week and receiving communion of Pascha. And to the puzzlement of the doctors, the cancer disappeared. It was not yet her time. The Gerontissa finally withdrew to quiet. With only one last nun she moved for the last time in this life, to the island of Leros. There they established the hesychastirion of the Holy Archangels. Only in this last year of her life did she accept the Great Schema at the hands of Fr. Dionysious from Little St. Anne’s Skete on Athos. He came to give her the Schema in the Chapel of the Panaghia in the Kastro on the top of Leros. Gerontissa Gabrielia passed from this world on March 28, 1992, having never built a monastery. Over the years, six of her spiritual children did become monastics, but never more that one or two were with her at a time. Only the angels could count the number of lives that God touched and changed through her. 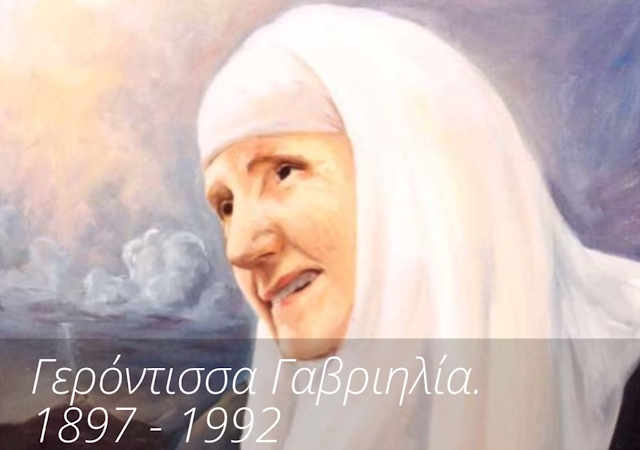 Her biography and collected writings were published in Greek in 1996, through the work of her last monastic daughter and the contribution of many, many others who held the Gerontissa dear. An English translation is in process. Anyone who knew the Gerontissa realized that God has not left us without His saints, even down to the present day. The few words recorded here scarcely suggest the clarity and love of her soul. Words are only the tools of this world; the wonder of the Gerontissa was wrapped in the mystery of the silence of the world to come. She never sought a reputation. She never allowed anything about her to be published during her long life and only allowed her children to take photographs in her very last years. Those whom God touched through her called her Gerontissa; she never made herself anything but the nun Gabrielia. She was humility and love incarnate. 1. Every place may become the place of the Resurrection. It is enough that you live the humility of Christ. 2. As for sleep, keeping vigil is enough. 3. There are people who are vigilant about some things, and there are people who are vigilant about all things. 4. Not a knowledge that you learn, but a knowledge that you suffer. That is Orthodox spirituality. 5. Do not desire many things–more than you have, that which is far away. Rather, seek to take care of what you have so as to sanctify it. 6. One thing is education: that we learn how to love God. 7. Nothing is cheaper than money. 8. Better hell here than in the other world. 9. It is not that which we say, but that which we live. It is not what we do, but what we are. 10. I put on the raso (the monastic habit), and I don’t say anything unless asked. The raso speaks. 11. If you have love for the whole world the whole world is beautiful. 12. Someone said that the Christian is one who purifies love and sanctifies activity. 13. We desire our freedom. Why? In order to be slaves to our passions. 14. Conference: When good-for-nothing people gather and decide that nothing can be done. 15. The aim is that even when we have the parasite in the head . . . we have the Paraclete in the heart. 17. One who loves does not notice, just as one does not notice that he breathes. 18. When the doors of Heaven are open, so the doors on earth are also open. 19. When the mind (nous) is not scattered in worldly things and is united to God, then the “Good day” that we say becomes a blessing. 20. Every rejection and negativity destroys our work. 21. We must not exist before every image and likeness of the Other. 22. In the beginning of our life we have need of the presence of another to love or befriend. As we progress, the One–God–fills us with such love and His joy that nobody at all is needed. All of this longing for another the soul does in the beginning because it still doesn’t know Whom it loves and therefore thinks it needs a certain person. 23. God often does not desire the act but the intention. It is enough that He sees you are willing to do His command. 24. Jesus Christ gave the golden rule: alone and with the other. 25. When God created us, He gave us life and breathed His Spirit into us. That Spirit is Love. When we lack love, we become corpses and are altogether dead. 26. The Christian must respect the mystery of the existence of everyone and everything. 27. To reach nonexistence, love, love, and love–and so identify completely with the Other, with every other. Then at the end of the day you ask yourself, “Do I want anything? No. Do I need anything? No. Do I lack anything? No.” That’s it! 28. The spiritually advanced person is the one who arrives at a place of no identity and who has understood in his depths that whatever happens is the will of God or by the permission of God. 29. Only when the person stops reading otherbooks except the Gospel does he begin to make real interior progress. Only then, united with God through the Prayer, can he hear the will of God. 30. Never desire anything but the will of God, and receive with love the evil that comes to you. 31. Do not respond to a person with the evil he brings you, but see Christ in his heart. 32. Never say, “Why has this happened to me?” Or when you see someone with gangrene or cancer or blindness, don’t ask, “Why did this happen to them?” But ask God to give you the vision of the other bank of the river. Then you will see with the angels as it is in fact: Everything is according to the plan of God. Everything! 34. If we want to be good monastics, we must at every moment think of God before monasticism. Otherwise we will not become good monastics. 36. Our most vulnerable spot is found in many words and discussions. 38. When you have thought of criticism . . . judging others, ask God to take hold of you at that hour so that you can love that person as He loves. Then God will help you see your condition. If Christ were visible, could you criticize? 42 What we say remains to eternity. 43 Only when you are perfected in Love can you arrive at dispassion. 48. When needed, God will send someone to us. We are all fellow travelers. 49. The language of God is silence. 50. Whoever lives in the past is as if dead. Whoever lives in the future in his fantasy (or imagination) is naive, because the future belongs only to God. The Joy of Christ is found only in the present, in the Eternal Present of God. 59. Better to say the Jesus Prayer aloud than not at all. 67. Anxiety and worry is for those who don’t have faith. 68. Love is only on the Cross. 69. Relationship is difficult when “I” stands above “You”. 70. As God loves you, so does He love your enemy. 71. Do you want to pray? Prepare to answer the Lord secretly. 74. We should arrange to live in the world like the oil and the water in a vigil lamp, which do not mix and thus are in and for God. In the world, but not of the world. 75. We are all containers; sometimes of the Light, sometimes of the Dark. 80. Only when we are “still”…not busy-bodies…busy-bodying…caught up in many activities… do we give the angels an opportunity to do something. 93. How beautiful is the Mystery of Tommorrow! 95. The Lord said: “Whoever wants something, believing he will receive. It is enough that the request is in agreement with the Commandments of God, that is with Love. 100. If you knew that you are not Here, then you would be There. 101. In order for miracles to occur, it is enough that we love. Neither prayer nor komboskini has such power. 102. My experience teaches me that nobody can help anyone, no matter how much they wish to of they love. Help comes only from God when it is His time. 103. When we have God always in mind, then God has us always in mind. 105. We are only useful when we do not exist for ourselves, and the opposite. 106. We must not make decisions for others. Leave them to the Angels and they will find the best solution. 107. Never forget that you are His. 108. Like Symeon of Cyrene we must be ready to run to the help of our fellowman. 109. If you seek assistance from someone who is busy, he will do it for you, not the indolent and the lazy. 110. Woe to me if I do not love. 111. Three things are needful. First Love, Second Love, Third Love. 112. The fasting of a diet is so easy when one wants to slim. And so difficult is the Wednesday and Friday fast when the Church wants it. 113. In the Church we should always sit in the same place, for the Angels. 114. After the Liturgy, we should sit in the Church so long as we can, for the Angels. 115. When we are talking and someone interrupts us, we should not continue. It means that he should not hear that which we would have said. The Angels do thus. 117. We are never anyplace “forever”. 118. Whatever happens to us is only our own fault. 119. Every morning open a new page and put your signature on the blank. Whatever God wants, let Him write. 120. When we pray, let us lock our door. 125. If you do not reach the point of despair, you will never see the Light. 136. Be still and know…There is no greater school than this kind of stillness of the mind. 137. The only true joy is freedom from worry. 150. Christ said to us: Go and make disciples of all nations. And we – hushing up – what do we do? 179. The most powerful prayer is the Epiclesis of the Divine Liturgy. 183. Love is a bomb the destroys all evil. 194. The greatest part of my prayer here and for years now is Thankgiving. What else should I ask, when I have everything? 199. God put the sense in the head. Why? Do you know? So that we can not see ourselves. Yes! So that we see only the other and love only the other. And so that we see ourselves only in the eyes of the Other. 243. Some want to go to the Resurrection without passing by way of Gologatha. 244. Because the Christians could not put in practice the Gospel while living in the world, they fled. That’s how they became the first monastics. 259. Every person is ‘sent’. 267. Our soul is a Divine Breath. Our body is His Creation. In the whole of us we are the icon of God. 290. Day and night let us bless God for the gifts He gives us. 291. Few words, much love. To all. No matter who they are. And Mother said . . .
– Only one thing do I know that I have always, and it is not pride, nor fantasy, but that which I have day and night, wherever I find myself–three things: first, Faith; second, Faith; third, Faith. That’s all! Nothing else can I say to you. It has directed all my life. – I say yes because I believe that if it is not for my good God will make it so that the No will come from the very one who invited me. Some paper will not be ready, or something will happen. Now, if they said, “And who are you? Why should we lose what we have? Why should we lose our profit? Where will you take us? What will you do with us?”–if they had said that, what would have happened? They would have remained in darkness. They said Yes to some Unknown who came and said, “Throw all that away!” Why? Because they believed in God, and they waited for the One who would say to them, “Come!” And that was the beginning. Because if we say No, what will happen? . . . One or the other: If you believe, you will walk on the water like St. Peter. If you are scared–Bloop! Nothing else. So I closed my eyes and saw that written within me. Because He said to us, “Why do you worry? Why do you worry? Even the hairs of your head are numbered!” Why worry? Faith is lacking. May we have faith. Again, Mother said . . .
With these five languages you can travel the whole earth, and all the world is yours. Love everyone as your own–without concern for religion or race, without concern for anything. Everywhere are people of God. You never know if the one you see today might tomorrow be a saint. The Lord said to His disciples: “Soon you will all scatter and leave me alone, but I am not alone because My Father is always with me”. The same with us, if we think about it. We are never alone. As soon as we turn to Him in a glance of our mind, we’ll find ourselves in the appropriate condition toward Him first, and then toward our fellowman. That is, if we want something, some enlightenment, immediately we run to the Gospel. (Certainly at the time when there is no suitable person. ), that is my start. In the Gospel is Eternal Life, that is, Himself. God gave us our conscience: His Gospel. In this conscience we always find an answer. . . . Another thing that helps a great deal, as we know, is frequent prayer. It’s not something that should be in words, neither in thought. The Prayer is not something we do: it is a condition of soul. And wherever you find yourself, whatever you are doing, in whatever circle you are, your soul can be found in the condition of Prayer. For the soul is from God. Next, when it is helped with prayer and the Jesus Prayer to be united with the Holy Name, then it continues, whatever you do… There is certainly the problem… because at the moment when you don’t think of God, then there is not the power to unite with God and thoughts come in with more power. 388. Come let us be silent. Listen to a talk (Greek) about her life here.